Real garlic is the best but when you don’t have time to peal the cloves or you just want something to sprinkle on veggies or bread, this is hands down my favorite. 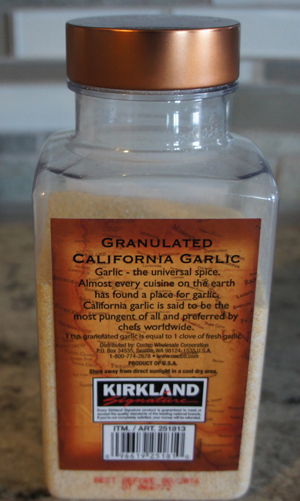 This is real granulated California Garlic that has been dehydrated and milled to size, no sodium is added (it’s not garlic salt or powder) or anything else except garlic that’s the main reason I like it so much and it is delicious, it is super strong so you don’ t need a lot when cooking with it. A favorite in the kitchen for sure over at my house. I often use it on my veggies or my homemade croutons, or garlic bread, or when cooking etc. 1tsp = 1 clove of garlic so it’s an easy conversion. I buy this at Costco, I kind of singlehandedly keep that place in business:).